Titanicus was first spotted in 1912 when he attacked and destroyed the infamous RMS Titanic. Many survivors believed it was an iceberg because of Titanicus’s extraordinary spike on his back. Now you can have your own Titanicus with this amazing 15 cm tall figure. This figure has four points of articulation and is made out of PVC vinyl. The figure is sculpted by well known kaiju 3D artist Dopepope, and every millimeter of this figure is magnificently detailed. Along with the amazing figure you will also get the 8 page origin comic which is illustrated by Brendan Purchase who specializes in bringing monsters to life. The first run will be limited to 1,000 pieces so order your before it is too late. This figure is the first of many new kaiju figures that Titanic Creations will be releasing so make sure that you are part of our kaiju revolution. This is only the beginning! The production vision for our Titanicus kaiju figure arose from our early passion for watching original Godzilla movies over and over. The mesmorizing classics Godzilla 1954, and Godzilla Raids Again were viewed hundreds of times. Later kaiju productions in the Godzilla movie franchise like Godzilla 1998, Godzilla 2000, Godzilla 2014, and the 29th production of legendary Japanese production company Toho Co., Ltd. - Godzilla Resurgance (aka Shin Godzilla) futher reinforced our enthusiasim for all things Godzilla-related. And like all true kaiju fans worldwide, our team at Titanic Creations, LLC will be first in line to see the upcoming epic "Godzilla: King of the Monsters", set to release by Toho in 2019! 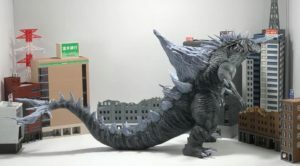 As avid collectors of the world renowned X-Plus Godzilla figures, we strongly felt that nothing short of the consistently high level of detail and quality found in X-Plus Godzilla kaiju figures would be satisfactory for our product. 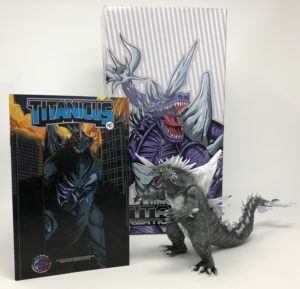 We believe our Titanicus figure will meet the expections for quality, detail, and craftsmanship of experienced X-Plus collectors of Godzilla figures wordwide. The Titanicus statue is an absolutely amazing sculpt that is superior to almost all other Kaiju figures on the market today. The depth of detail on every single millimeter is absolutely astonishing to the eye. The sculpt was done by Kaiju enthusiast and expert 3D modeler Dopepope. Glow In The Dark Titanicus! 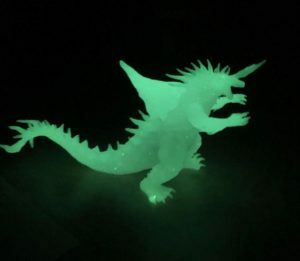 Our latest release in the stunning Titanicus 15 CM Kaiju line is the exciting new glow in the dark figure! Pre-Order Now - Estimated to ship January 2019! Get the stunning Titanicus 30 CM figure before they are all gone!